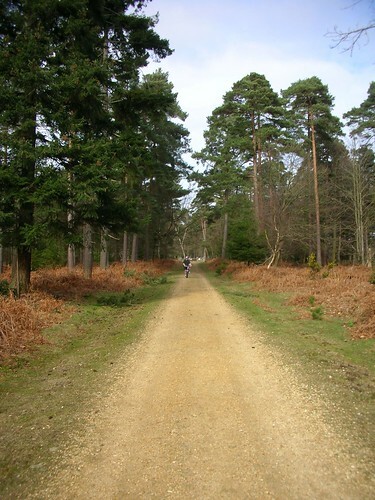 The New Forest is a clash of expectation and reality. As we agreed, driving through rolling scrubland on the way to Bournemouth, it isn’t new, and for a forest it seemed to be sadly lacking in trees (although there was an evidence abundance of ponies to compensate). So on our way home last Saturday, we thought we’d go and look for those trees. One thing the New Forest really has going for it for the explorer of diminished energies (two days of beach and sea air will do that to you), is a comparative lack of hills, so we decided to work it to our advantage and hired out one baby seat, two bicycles, three helmets and a kit bag from the cycle hire shop in the little village of Burley for a bit of fun for us, and to give Kitty her first taste of two-wheeled transport. 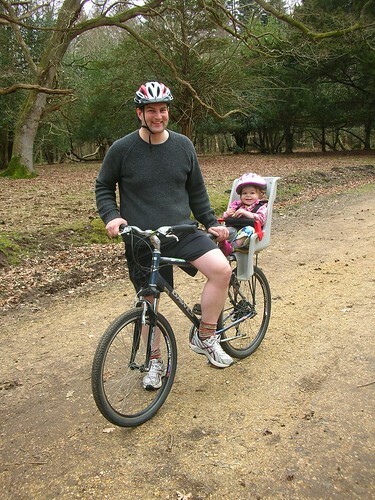 Sat on the back of H’s bike watching the forest gently trundle by, with occasional glimpses of her Mama as I panted up the inclines behind them, she was all smiles and chatty giggles. 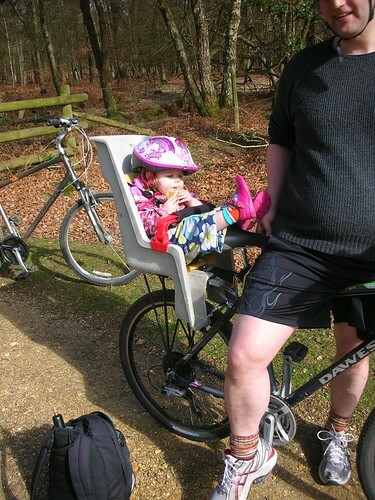 In fact, our little co-pilot was so relaxed in her role as back-seat driver that whenever H got off his bike to go through a gate, or grab a swig of water from my pack, he would find a tiny pair of pink shod feet resting on his saddle when he climbed back on. 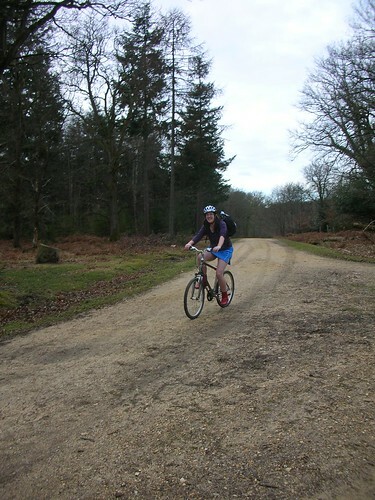 We chose a woodland trail route map from the bike hire company; mostly off road, and the road we were on was mostly closed to cars because of planned logging, leaving it largely in the possession of packs of lycra clad road cyclists and the occasional pink-cheeked tourist. We turned off the road onto a wide gravel path and into the deep stillness of proper forest. I think we were supposed to be looking out for deer, or ponies, or even more cows, but for the first half of our wide loop we saw nothing moving faster than lichen (and on occasion, that included me). 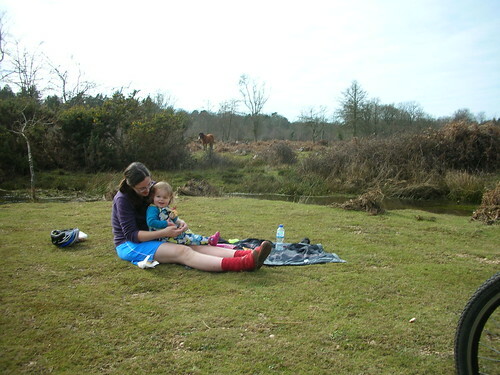 We stopped for lunch (our first picnic of the year – yippee) by a little brook that the route map rather optimistically described as ‘Black Water’, under the steady gaze of a beautiful New Forest pony who eyed up our sausage rolls, hot cross buns and apples from the other side of the bank without moving a muscle the whole time we were there. It’s been years since we just went for a bike ride and I think we’d both forgotten how much fun it is to explore with two wheels (although given our love of mountains, perhaps we should stick to two feet for those). After the initial giggles and a good lunch Kitty fell asleep with her helmet drifting ever lower across her forehead and didn’t wake up until it was almost time for ice-cream so I think she’s a fan. And then it was time to hand back our bikes and tuck our saddle-sore selves into the car to drive the miles back up home. Tired, slightly sandy and with lungs full of fresh air and sunshine, what more could anyone want.